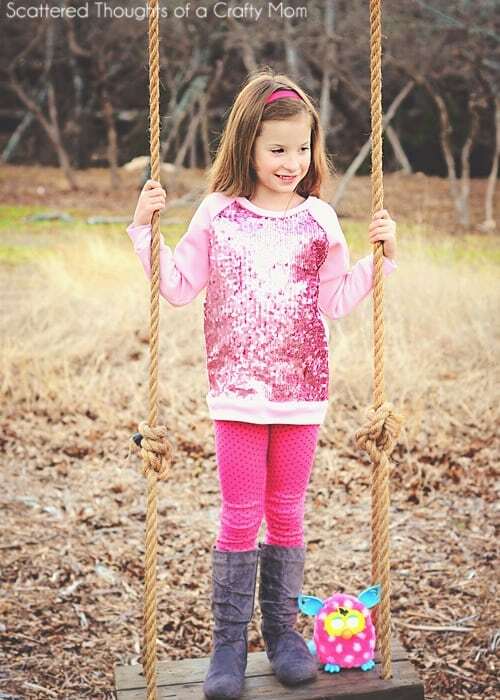 Learn how to sew a raglan tunic top for girls using this free raglan top pattern in sizes 4, 5, 6, 7, 8. The pattern is in 5 sizes (4 to 8). It took me a little longer to get this pattern ready. Right in the middle of my pattern making process, I decided to learn a new software program. Ugh! It was very frustrating. I would work on it for a day, then quit for a few days, then I would come back and back up from where I left off because I forgot what I had already learned. But its done now and I’m so happy to post this pattern and tutorial! The top is a slimmer-fitting tunic length, but you can lengthen or shorten it to your taste. I tested the size 8 on my son, and rather than putting the cuffs on, I opted to just add the 2 inches back to the sleeves instead of the cuff and left the bottom band off. 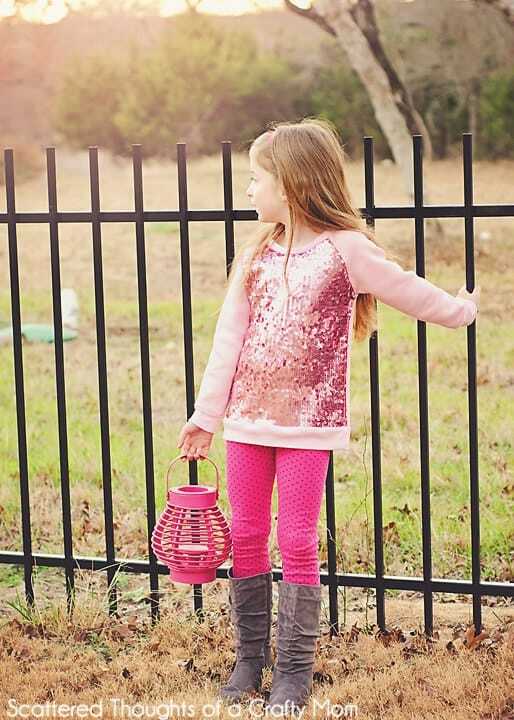 You can use sequined fabric or just use a cute knit. If you do use sequins, I recommend using either a smaller/thinner sequin fabric or pairing the sequins with a lighter weight knit, such as interlock, french terry or a med/heavy weight jersey. 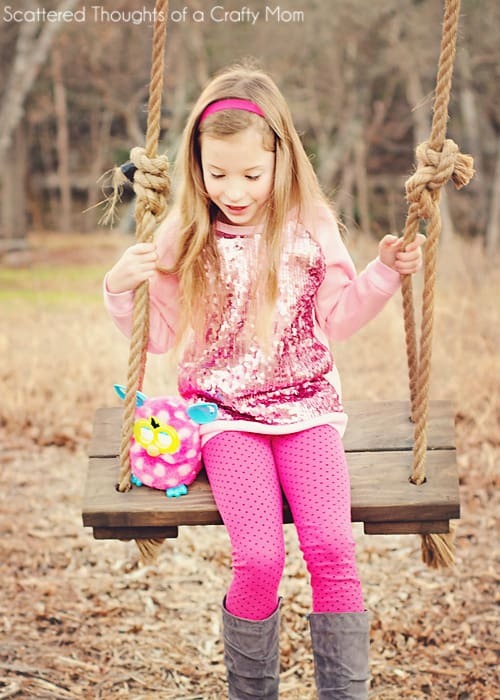 Are you ready to make your little one a raglan tunic top? You are going to love how easy this top is to make! 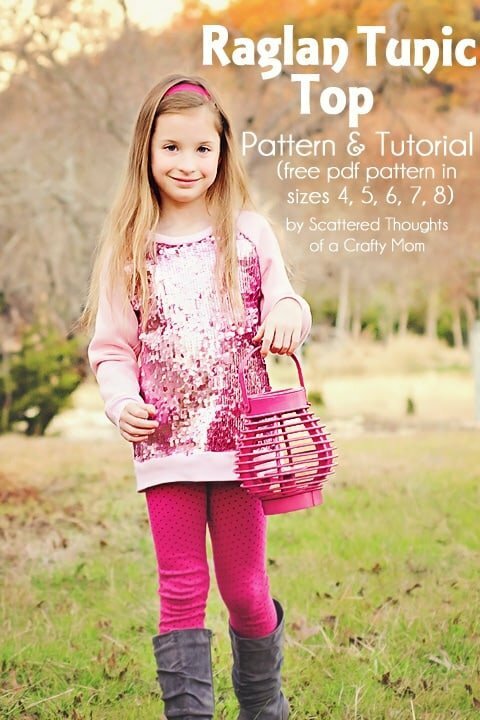 Head over to page 2 for the pattern download link or page 3 for the sewing instructions. This is really cute! I love it. So cute and I can't wait to see the version for you! Love this, thanks for the free pattern! So cute! I want to try this! What a beautiful shirt! I really really wish I could sew. You are so talented Jamie! I LOVE this shirt! I'm not very good at sewing but I love this idea so much I just might try! Thanks for sharing! LOVE this top. My 6 yr. old daughter has been loving an embellished crew neck sweatshirt this winter…and this is the queen of embellished crew neck sweatshirts! Wish I had better sewing skills cuz I'd make a few! So lovely, that sequin fabric looks a little bit tricky to work with but it's SO worth it. Lovely!!! Thanks so much for the pattern. That is so cute! I will definately have to pin this to sew for later. My girl loves sparkle and this would fit the bill for sparkle!! Thanks for sharing. 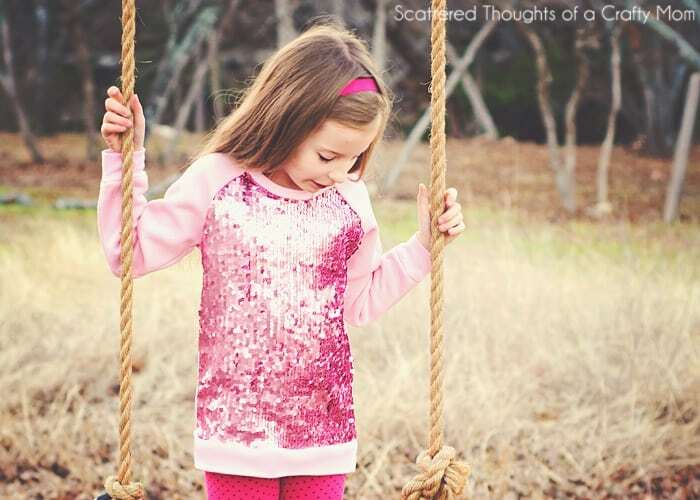 great top my little girl who is nearly 3 yrs would love this as she is mad for pink. You are in luck, I'm posting the adult version next week! Thanks for all the great patterns and tutorials. Thank you so much for this pattern … I had some left-over "sparkly" fabric from making my munchkin a "disco skirt" for a birthday party she went to last week. Just used the rest to whip up the cutest "sparkly tunic top" for her. She loves it!! I just saw this same pattern in the Mc Calls Catalog, was that yours?? if i wanted to size this up to a 10, how hard would that be? Many thanks for this tute. For once, I had the occasion, thanks to it, to sew something for my elder daughter. Thanks for sharing this pattern. I added a turtle neck to this pattern to make it winter proof and I love it! It turned out so cute! Please, how much I should shorten the lenght of the pattern, if I want to sew top instead of tunic? Thanka for reply and for free pattern. Depends on the child’s size and measurements. 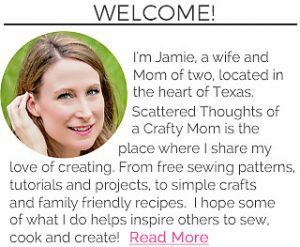 Hi Jamie, thanks for the pattern. I had some problems with the printing and sizing even though I used Adobe acrobat.ni measured up against my daughter’s tops for size. Your tutorial was excellent and I’m really happy with the result . This is my first bit of sewing for a long time and used a patterned and striped fabrics, which I remember from school. Is a no no !!! She will love it though. When printing, make sure you have turned off sizing. In my adobe reader, the default setting is “fit” which is wrong and I have to change it every time. (you should be printing “actual size”) and choose auto portrait/landscape. You can compare the 1-inch block to your ruler to confirm the pattern has printed the correct size.